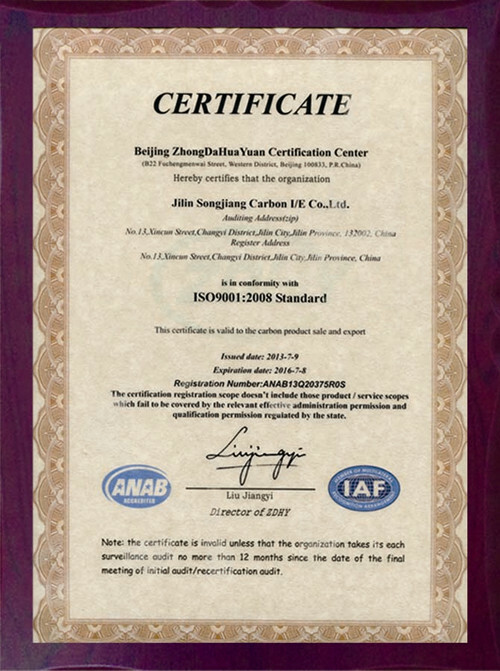 Company Overview - Jilin Songjiang Carbon I/E Co., Ltd.
6YRSJilin Songjiang Carbon I/E Co., Ltd.
Jilin Songjiang Carbon I/E Co., Ltd. (JLSJC for short, logo:JSC) is located in Jilin City,Jilin Prov, Fronting twist and turn of the Songhua river, back to the good-geomantic scenic Beishan Mountain. JLSJC is a professional international-trade company. 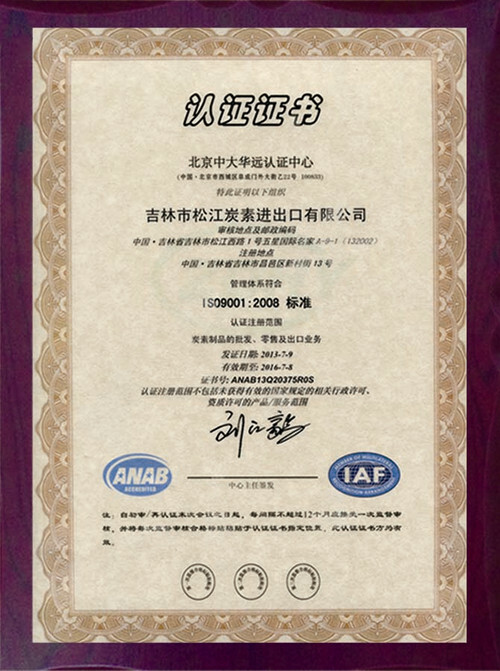 Our company implements standardization management and have attained ISO9002 QMS certification. 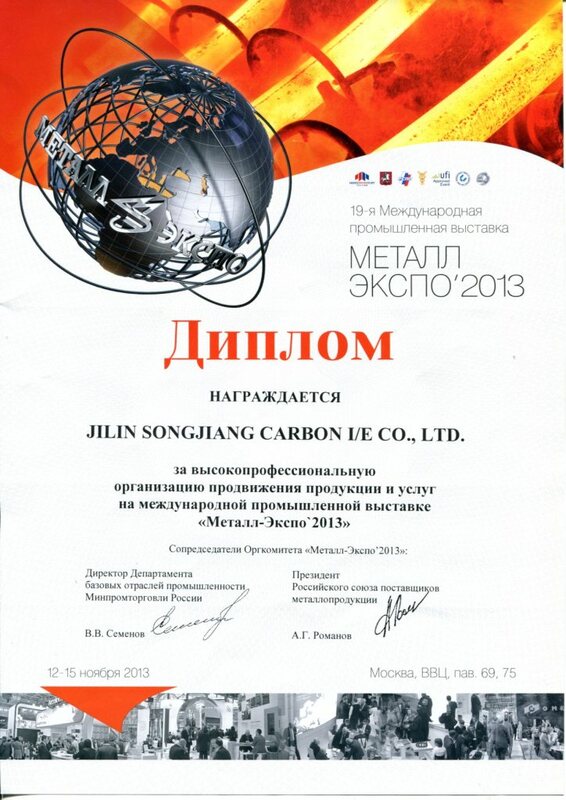 Main products are graphite electrodes, graphite powder, graphite blocks and other carbon products. All products of JSC meet international quality standards, are exported to Asia, Europe, South America, Africa and other more than 30 countries and regions, enjoy a good reputation at home and abroad. In 2004, the company was independent from Jilin Songjiang Carbon Co., Ltd., after nine years down to earth, arduous operation, developed into both has entity industry and international trade business ability enterprise. Its annual turnover is 150 million yuan. Exports amount is more than 20 million US Dollars. Carbon products exports quantity is among the best in the country. 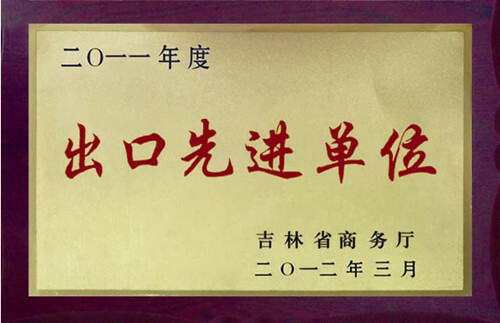 All above achievements thanks to our unique four big advantages:I.Strong supply support capabilities1.Play Jilin Songjiang Carbon Co.,Ltd. strong production capacity of our company supply security role. Jilin Songjiang Carbon Co., Ltd. is a large state-owned enterprise, with thirty years of carbon products production history, strong technical force, advanced equipment.2.Build own machining production line: in 2008, we invest and built a mechanical processing production line nearby jilin international intermodal inland port, so that our products supply capacity and product terminal quality control ability enhance further. can meet multi-special requirements of clients.3.Invest production base: invested an annual output of 20,000 tons of carbon products manufacturer, located in high-quality raw materials production base of China Liaoning Province, as our main production base, it owned advanced production equipment, a full set of carbon craft supply support capability, with good quality, sufficient quantity and complete variety. II. Perfect quality control support capabilities1.We own a professional quality management and process inspection team, is the only foreign trade company has QC team in China. The QC team carry out strict inspection at each stage, strictly control the quality control points.2. Our experience senior engineer would make re-inspection for all products before loading, unified logo and packing according to rules of company, control the last line of quality for customers. III.Excellent cost performance IV.Fast high quality service1. Simplification of organization and service processes achieve the flattening process,so deal with customer demands rapid response mechanism is really effective.2 The whole tracking of pre-sale, selling and after-sale service, and can carry out site service, participate in customer production, looking for problems in practical applications, to provide targeted services.In retrospect, history of trials and hardships. Looking ahead, JLSJC has great targets, focused on developing five capabilities: I: Carbon products supplier of resources integrationII: Carbon products applications and solutions to problems service providerIII: Carbon products manufacturerIV: The diversified international trade agentsV: The new projects developer at home and abroad market.JLSJC will pursue the tenet customer-centered, employee-based as enterprise purpose, the perfect service as our core products and competitiveness, to maximize the interests of customers as the starting point of our service and all actions. Provide the most excellent products, the most favorable price and the most perfect service to all customers. Welcome global customers to establish cooperation and create a bright future together with us.